A field is to a phase or start form what a brick is to a wall: they’re the elements that, together, make your pipe exist. 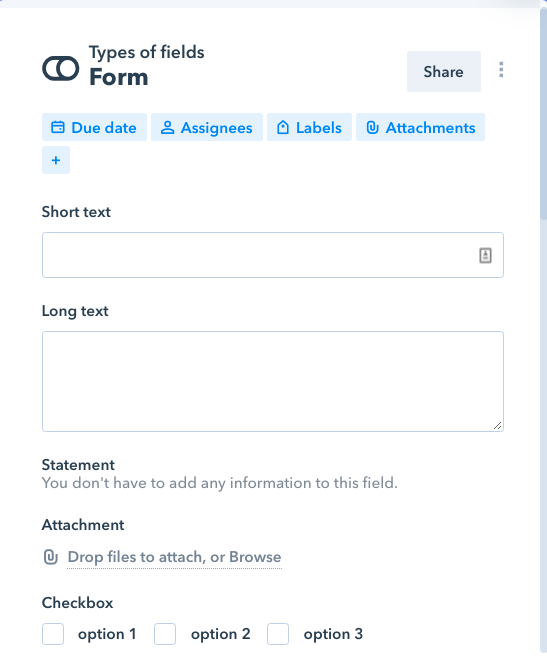 Everything you see in a start form or in a phase (instructions, radio buttons, checklists) they’re all fields, and you can create and edit as many fields as you need to standardize your process. The fields represent your process’ rules. you can use the different types of fields to give instructions to your team members on what they need to do in this phase, ask for mandatory information before the card can be moved to the next phase, select who to assign the activity to, etc. This will ensure a standard pattern of execution in order to prevent misunderstanding among team members, mistakes and inefficiencies.